Don’t leave your evening to chance, call SOUNDS UNLIMITED. We take pride in what we do and we have awesome reviews. Our company has been in business for over 40 years. That’s A LOT of satisfied customers. For your peace of mind we always have backup systems and staff available so accident or illness will not affect your special day. Besides being professional, punctual and courteous, our DJs are also FUN and will make sure that you and your guests will have a blast! The DJ is the Backbone of any Great Party! Since 1972 Sounds Unlimited has been providing Calgary and surrounding area with top quality DJ and entertainment services. We are referred by Calgary’s finest hotels and establishments. 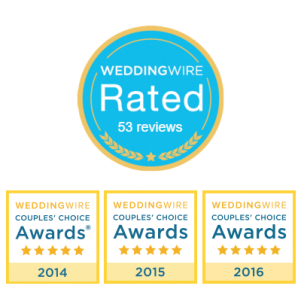 Also, we’re the proud recipients of the Wedding Wire Couple’s Choice Award for the past 3 years. Why? Because we have amazing clients who give us amazing reviews! We make customer satisfaction our #1 priority and pride ourselves in our attention to detail. The DJ is the backbone of any great party and we have hired some of the best DJs in the industry. We are here to help you plan an event that your guests will talk about for years to come and we make the planning part easy.